The Jungheinrich EZS 6250 is a versatile and economic tow tractor for towing trailers up to 25,000 kg. The ability to couple several trailers together allows loading characteristics to be varied and provides for the flexibility required in material-handling operations. The coupling is visible from the operator’s sitting position, and is easily accessible. The semi-automatic remote release (optional) allows the coupling and decoupling of trailers without the operator having to leave the vehicle, saving both time and money. Another of the vehicle’s advantages is that the EZS 6250 is available with many different tow couplings to allow it to fit every trailer type. High performance is ensured with the three-phase-technology drive motor. The advantages: quick acceleration and high top speed. At the same time, significant energy savings, longer operation time and minimum maintenance requirements are realised due to the omission of the carbon brushes. This performance is achieved through the optimal cohesion of drive motor and drive controller with the added benefit of regenerative braking. Due to its very tight turning circle, the EZS effortlessly handles tight spaces with flying colours. The sprung wheels offer high travel comfort and safety even over uneven flooring. Other highlights include the variation of available cabin types, hydraulic steering and regenerative braking. The sprung loaded wheels offer both travel comfort and safety. The automatically activating parking brake reduces roll-back on slopes. High degree of efficiency with excellent energy management. High top speed, even when laden. The speed set by the accelerator is automatically maintained under all travel conditions including on gradients / descents. Safe starting and stopping, also on slopes with the electric parking brake (that automatically engages when stationary and automatically releases when starting). Adjustable steering column and seat for optimal sitting position. Hydraulic steering: Easy to operate, no kickback. Ergonomic controls for comfortable operation. Highly visible and accessible coupling from the driver’s position. Fast, easy coupling / decoupling of trailers with semi-automatic remote unlocking from the operator position (optional). Various couplings available for different trailer types. Inching buttons for simple coupling and decoupling. CSE non marking tyres (optional). Many surfaces / compartments for operator materials, pens, papers, etc. Frames from 8 mm high-quality sheet steel. Extra high chassis apron on the front bodywork. Energy-saving 3-phase AC technology and high battery capacity ensure long operating times. Standard version: 80 V/620 Ah. 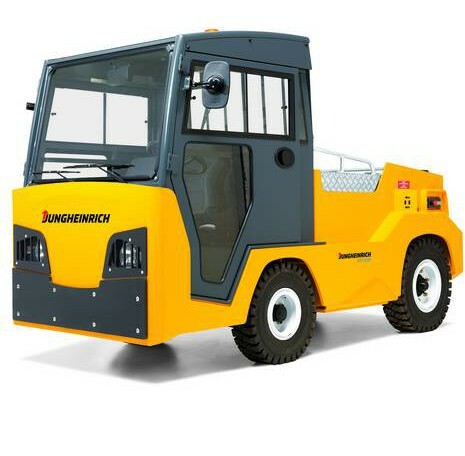 Exchangeable with batteries from the Jungheinrich EFG 425 electric 4-wheel fork lift. Comprehensive display and setting instruments always allow a complete overview of system operations. The operator display provides information about the battery discharge status, operating hours and fault codes. An extensive array of supplementary equipment allows the individual adjustment of the vehicle to your application. Built-in battery charging socket mounted on the tow tractor.